Kerosene lamps and lustres flank an old clock on one of the mantelpiece. The three remaining fireplaces are no longer used, the house instead being warmed by heat pumps. The hall features an internal stained glass window. A hand-curved, turn-of-the-century Ansonia clock keeps perfect time. The owners have replaced all the home's paper shades with old light fixtures. This one has women is crinoline skirts painted on its shade. A 1920s mannequin looks at home in one of the four bedrooms. Beaded purses hang in the hall. The main bedroom with its bay window. When the owners move in, their 7-year-old son was excited to find what he thought was a telephone over the bath. In fact, it was a handheld shower head with a telephone-style cradle. A statue and urns welcome visitors to the front door. A false door is a playful addition to the bland walls the original concrete well, which Rex Johnston thinks probably held about 1000 litres of water. A sundial marks time in the garden. 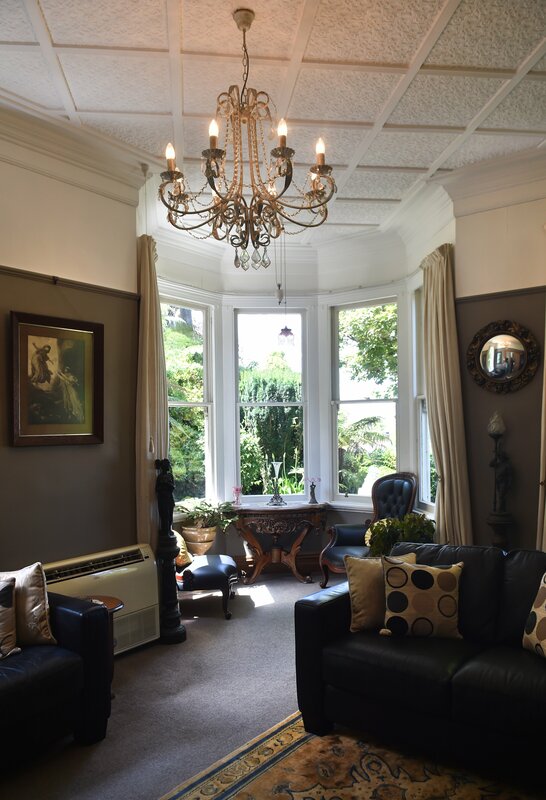 Walking through the front door of this Dunedin villa is like stepping back in time. Not only does it retain many of its period features - 3m-high ceilings, polished wooden floors, traditional fireplaces - it is also a reminder of other bygone eras with its 19th-century kerosene lamps, 1920s mannequins and 1950s art. "It's an eclectic mix," says Judi Johnston, who, along with husband Rex, moved here 14 years ago from a colourful 1870s cottage at Tokoiti, near Milton. Co-owner Rex Johnston relaxes on the front veranda. The couple have always loved old properties and the Mornington house, while needing work, had a pretty exterior and sweeping views across the city out to sea. Even as she stood in the hallway, Mrs Johnston knew what they would do to it: "Every house has potential. You've just got to be able to see it." Removing a small garage on the street and a big holly hedge that obscured the house were two of the couple's first priorities. They turned the laundry into a sun room, reroofed, rewired, double glazed and scoured auction houses for old light fixtures. In the kitchen, they installed new cabinets, removed a wall to let in more light, and put in French doors to connect with the back garden. Outside, they planted rhododendrons, roses, camellias and Mexican orange blossom, adding a formal touch with buxus hedges and statues. The couple say the back of the house once ended at their dining room - the coal range hidden behind wood panelling suggests this was originally the kitchen - but that a laundry, bedroom and new kitchen appear to have been added in the 1920s, probably after an outhouse was demolished. White and reflective surfaces make the small kitchen look bigger. The French doors replaced an old sash window. A few other changes have been made over the years, but they like that the 170sq m, four-bedroom home has not been "mucked around". "It's a lovely house to live in because of the warmth of the place and the colours," Mrs Johnston says. "It's not like walking into a modern home that feels like a dentist's room - very white, lots of stainless steel and not much going for it. It's got lots of character." Records show that in the mid-1870s, the section was part of a larger block owned by James Rattray. Arriving in Dunedin in 1860, Rattray established merchants and stock and station agents Dalgety, Rattray and Co and imported 40,000 young merino ewes from the best flocks of Australia before going on to form his own company. The Johnston's house is thought to have been built about 1895 when most of his land in Neidpath Rd was subdivided. The lounge has a sitting area under the turret and a pressed tin ceiling. Previous occupants have included a draper's assistant, a pastry cook and, in the 1920s and 1930s, several "Salvationists". The decorative pressed tin ceiling in the lounge and the old meat safe in what was the kitchen are two original features. So, too, is the large outside well that would have collected rainwater and fed it by gravity into the kitchen. Bored with the look of the well's concrete walls, the Johnstons added a door, complete with door knocker - a ruse that has fooled at least one visitor sent to collect an item from the "shed". Filled with modern and antique furniture, their house also contains all sorts of collectables, from art glass to old clocks, mirrors and plant stands. The terraced front garden includes red, white and pink-flowering rhododendrons, roses and camellias. The gate and the kauri posts either side are original. Inside the front door, vintage beaded purses hang above a collection of umbrellas with elaborate handles. Further along the hall is a wall-mounted telephone that Mrs Johnston used to crank to call their children for dinner. Ceramic ducks and kingfishers, in sets of three, take flight on the walls. A hobnail crystal perfume bottle is one of dozens once displayed in the main bedroom and a few antique dolls remain from a collection that used to number 300. Mrs Johnston explains they had "a lot more stuff and a lot more variety" when they first moved in, but over time, she has parted with about two-thirds of it. "I got over the sheer clutter," she says with a smile. "I'm turning it down a bit."